We all know that radiant orchid is the color of 2014, but I'm not quite over this beautiful blue. I'm talking about cobalt. It's so rich and eye catching and I can't get enough of it. It pairs beautifully with yellows, plums, and even black. This strong blouse commands attention. The black lines are cut perfectly, and yet, the shirt is a sheer lightweight material making the top feel airy and feminine. 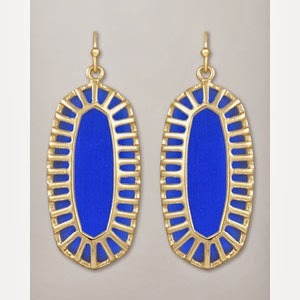 This statement earring is all you need to complete the perfect lbd look or maybe throw on some jeans and loose blouse with these beauties. Ok, here's something I will spend on. This is a well constructed pencil skirt in a material that is four seasons. It's fully lined, double vented, and a beautiful alternative to navy. 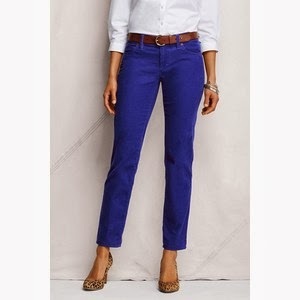 Ankle pant cords are perfect for this time of year and into early spring. Throw on heels show some ankle and get going. Cobalt is that perfect shade of blue for all four seasons. You can find it on bags, shoes, clothes, jewelry you name it. Why is it so popular? Because this vibrant color looks great on everyone.